Another great educational and entertaining book by Janet Halfmann is Home in the Cave. I really like all the books I have read to date from Ms. Halfmann who has the ability to take typically perceived non-adorable characters such as snakes and bats and turns them into great stories to teach. The stories all have a teaching component about the particular subject but it also has an entertaining aspect such as learning why bat shouldn't be afraid to leave his home in the cave. Baby bat is so comfortable with his mom in the safety of the cave since it's all he has ever known. He hears the stories told by other baby bats and becomes increasingly frightened at the prospects of ever leaving. In an attempt to not disappoint his mom, he practices his flying ability and ends up meeting an unexpected partner who will teach him the importance of his existence with the others in the cave. 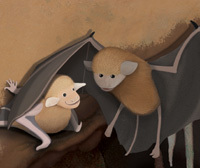 Baby bat soon understands his role and changes his mind about growing up and leaving the cave. The story might also appeal to younger children first leaving for school given their fear of leaving their "cave" as well. I found it entertaining with innocent little baby bat and the inclusion of bits of scientific information. The back section includes something very familiar with Ms. Halfmann's other stories which is a creative minds extra. Teachers, parents and those who homeschool will find it full of a wealth of information that surpasses it as only an entertaining story. From life in a cave to rock formations to bats, the children will most likely enjoy the extra sections at the back. Ms. Halfmann has many children's books to her name that will provide entertainment and great topics to teach. 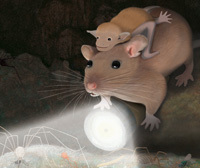 Shennen Bersani, award-winning children's book illustrator, provided the vivid and detailed illustrations. I recommend the 32 page Home in the Cave which can be purchased at Sylvan Dell Publishing. *Disclosure: I was not compensated for this review. I did review via a complimentary e-Book link provided by the author on the Sylvan Dell Publishing site. Thanks so much for the great review of my new book. I like how you saw similarity in Little Bat's fear of leaving his comfortable cave to a child's fear of going to school for the first time. Happy Reading to All!